Rinse lamb and pat dry. Sprinkle lightly with salt and set in a shallow 10- by 15-inch pan. Pat thyme all over meat; lay rosemary sprigs on the leg. Rinse figs and lemons. 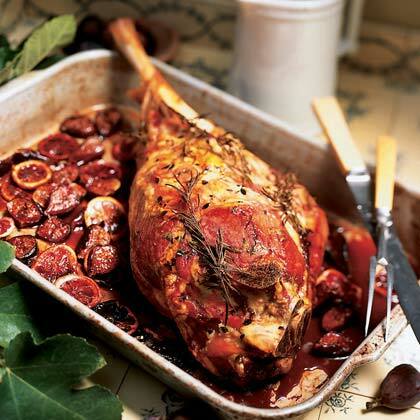 Cut figs in half lengthwise through stems and lay, cut side up, around lamb. Trim off and discard ends of lemons, then thinly slice lemons crosswise and discard seeds. Scatter slices over and around figs. Pour about 1/2 cup wine and the vinegar into pan. Sprinkle fruit with sugar. Bake in a 400° regular or convection oven until a thermometer inserted through thickest part of meat to the bone reaches 130°, about 1 1/2 hours. As liquid evaporates, add more wine to pan to prevent scorching. Occasionally, turn fruit gently. The edges of the pieces should get dark; if fruit starts to scorch, remove from pan. Transfer roast and fruit to a platter and keep warm. Discard rosemary sprigs. Add enough broth to pan to make about 3/4 cup juices total, then add cream. Bring to a rolling boil over high heat, stirring to release browned bits. Pour into a small bowl or pitcher. Slice lamb and serve meat and fruit with pan juices. Add salt to taste.